You can now register for the 2018 Climate Existence Conference here! Registrations are open until the 20th of April. The Climate Existence Conference aims to explore climate change as a human experience, not simply a problem to be tackled with numbers and technology. 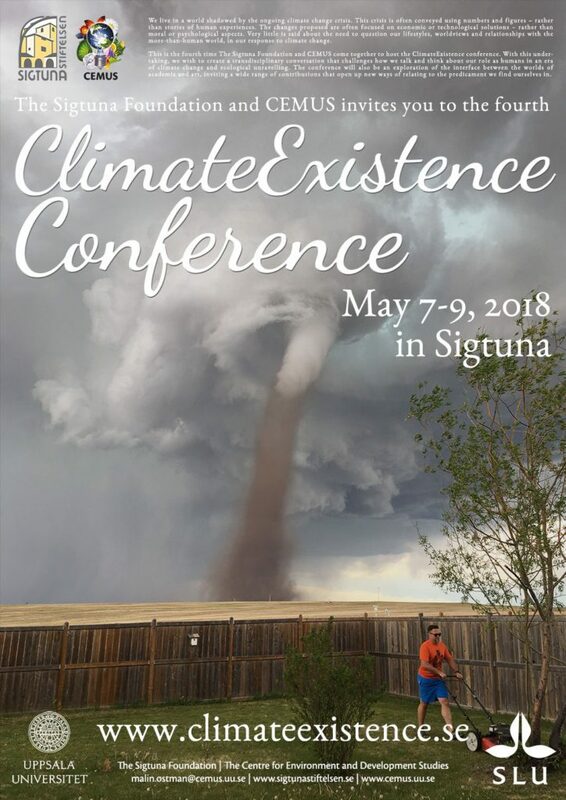 This year marks the 4th year of the Climate Existence Conference, run by the Sigtuna Foundation and CEMUS, the Centre for Environment and Development Studies, at Uppsala University, with the conference taking place in Sigtuna, Sweden from the 7th-9th of May. This year, the Climate Existence Conference will focus on the ‘interface between the worlds of academia, art and politics’. To do this, the conference will bring together artists and academics alike to share in a transdisciplinary evaluation of human experience and the predicament that is climate change. Contributions of any format are welcome – including art installations, performances, poetry, workshops, or traditional academic papers, among many more – provided the piece explores human social and cultural experiences of climate change and the challenge it poses. More information, including thought-provoking questions and suggestions for submissions can be found here. Ideas and/or complete pieces welcome! To ensure a wide range of submissions are received, the submissions deadline has been extended to the 1st of February. Challenge our assumptions about thinking and being in a climate change world by exploring these problems at Climate Existence. To find out more about the 2018 Climate Existence Conference you can visit the homepage here, or submit a contribution via email directly. Finally, to whet your appetite for the 2018 Climate Experience Conference, we have included a video from a previous keynote address delivered at the conference (ArtCOP21 – A global cultural movement on climate change, by David Buckland from Cape Farewell).